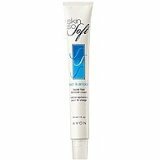 Avon Hair Removal Cream Reviews. Very affordable and easy to use. Removes facial hair without causing any chemical burns. Most other products unfortunately do cause irritation and/or chemical burns. This product is rather mellow and works very well without overdoing it and providing irritation of any kind. Removes your hair for around 10 days. Can be used on your back and shoulders. No irritation smell to put up with. Very easy to spread on and easy to wipe off. Your hair will come off easily without leaving behind any redness or irritation of any kind. Also, no ingrown hairs or red bumps to deal with.